The rotator cuff consists of four muscles, which reinforce the capsule and control the three basic motions: abduction, internal rotation, and external rotation. The supraspinatus lives above the joint, while the infraspinatus and teres minor muscles cross the joint posteriorly; all three muscles insert onto the greater tubercle of the humerus. Subscapularis is the fourth muscle, attaching from the anterior surface of the scapula, crossing the glenohumeral joint anteriorly and inserting onto the lesser tubercle of the humerus. The rotator cuff muscles provide dynamic stabilization to the humeral head on the glenoid fossa, forming a force couple with the deltoid to allow elevation of the arm. Static stabilizers consist of articular anatomy, glenoid labrum, joint capsule, and glenohumeral ligaments. Dynamic stabilizers include the rotator cuff muscles, long head of the biceps tendon, scapulothoracic motion, first rib motion, and other shoulder girdle muscles (pectoralis major, latissimus dorsi, and serratus anterior). As basic science and clinical research continue to enhance our understanding of the pathophysiology of rotator cuff disease, partial thickness tears appear to be the end result of a common pathway from multiple contributing factors. These factors can be broadly categorized as either intrinsic or extrinsic to the rotator cuff tendons. Intrinsic causes can be subclassified into age-related metabolic and vascular changes that lead to degenerative tearing or intratendinous lesions developing from shear stress. Extrinsic causes may be because of either subacromial impingement, shoulder instability (typically anterior), internal impingement, single acute traumatic injury, or repetitive microtrauma. Often, more than 1 of these factors (either intrinsic or extrinsic) is responsible for the development of a partial-thickness tear. The scapula-thoracic articulation affects rotator cuff function; this is described as scapular dyskinesis, which is frequently seen in association to rotator cuff disease. The patient with a rotator cuff tear presents with either primary or compensatory impairment of the scapular stabilizing musculature, which leads to subtle winging or abnormal kinematics. The mechanism of injury is essentially the same between partial and full thickness tears in athletes as well as the general population. There does not appear to be significant difference in incidence of tears between groups of people with and without symptoms. In the 40-49 year age group both groups demonstrated an equal number of tears (58%), while in the 50-59 year age group the incidence of tears between in the symptomatic and asymptomatic groups continued to remain equal, increasing to 78%. It appears that the presence of pain may be of more relevance than the size of the tear. 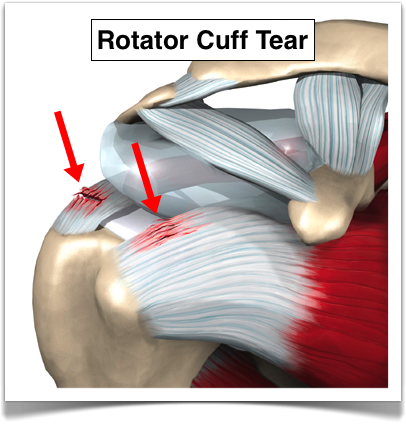 Rotator cuff syndrome commonly refers to a thickness tear. Patients with symptomatic shoulders that have radiologic evidence of full thickness tears of the rotator cuff experience pain and reduced functional ability. The reduction in function could be substantial, including inability to dress, attend to personal hygiene and use utensils to eat. Pain could be so severe that sleep is disturbed. However, there is considerable uncertainty as to why the presence of a full thickness tear of the rotator cuff may be associated with disabling pain and loss of function in some individuals and be asymptomatic in others. Shoulder impingement syndrome is the most common disorder of the shoulder, resulting in functional loss and disability in the patients it affects. Susceptible individuals to impingement and rotator cuff tendonitis include those workers who use the arm repetitively in the horizontal position or above. Various occupations, such as mill workers, carpenters, slaughterhouse workers, jackhammer operators, and shipyard welders, have all been noted to have elevated levels of shoulder pain. Any athlete using an overhand arm or throwing technique can also be at risk. Although overuse of the throwing shoulder can contribute significantly to injury, many difficulties begin with improper mechanics and poor conditioning. Common problems in pitching mechanics that can lead to injury begin with the foot plant. Hyperextension of the knee while planting the striding leg and landing on the heel cause a sudden deceleration of the body, which results in undue counterforce on the throwing arm. By definition, impingement syndrome refers to a pathologic condition in which there is irritation of the supraspinatus tendon secondary to abrasion against the undersurface of the anterior one third of the acromion. The acromion is classified into three different shapes type I (flat), type II (curve), type III (hooked). The type III hooked acromion has been found to contribute to 60% of rotator cuff problems. Impingement syndrome can be classified as either primary or secondary. Primary impingement syndrome was defined earlier. Secondary impingement syndrome normally occurs in the younger individual and in athletes and is defined as a relative decrease in the supraspinatus outlet caused by instability of the glenohumeral joint. Scapulo-thoracic muscle weakness has also been attributed as a secondary cause of impingement syndrome due to lack of scapula stability, causing resultant glenohumeral instability. This has the best rotator cuff syndrome prognosis. The literature could not explain a definite difference between rotator cuff tendonitis and tendonosis. The majority of authors put both in the category of rotator cuff tendonopathy. More research must be done in this area to suggest a definitive definition that could separate these two rotator cuff pathologies. These common tendon disorders place a burden on health care resources, particularly with regard to occupational and sports-related injuries. Tendons are maintained by the tenocyte production of collagen. The tenocyte must be able to increase collagen and matrix production in response to increased loading. Additionally, adequate blood supply must exist to maintain viability of the tenocytes. The area of insertion of the supraspinatus muscle has been shown to be a watershed area of diminished blood flow that is particularly susceptible to repetitive overload stresses. The normal processes of aging have also been shown to be a major contributing factor to the failure of the rotator cuff. The repetitive stresses of throwing or working overhead may speed up normal degeneration that can occur over time. Therefore, repetitive stressful loading of the rotator cuff as the cuff muscles attempt to resist distraction, horizontal adduction, and internal rotation of the shoulder during arm deceleration in throwing can result secondary to fatigue in an acute inflammatory response in the early stages and in tendon failure in the late stages.